It’s road trip time for Kitty Norville. Remember the vampire Anastasia from Kitty’s House of Horrors? She’s back and she’s asking Kitty to come to San Francisco to retrieve an object of great power. 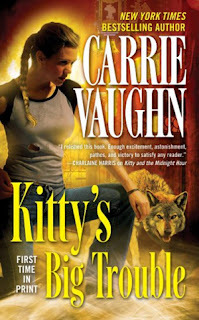 Evil and super-old vampire Roman is after it too, so Kitty hits the road with Ben and Cormac, headed to the west coast. The object, which Anastasia calls “the pearl” is hidden in the underground tunnels of Chinatown. And as our group of heroes goes searching for it, they get wrapped up in some ancient Chinese mythology. Kitty realizes, once again, how much she still doesn’t know about the supernatural world. But even in the face of gods, she holds on to her fighting spirit and struggles to do the right thing, while protecting the two people she cares most about. I suppose it sounds good at face value, but I felt unengaged for most of the book. Yes, there was a little danger, but I guess the key word here is little. There was virtually no tension for me to latch on to. I mean, the series has completely lost anything resembling a romantic or sexual tension. Ben is a nice guy; he loves Kitty; she loves him; blah, blah, blah. Cormac is there as some bizarre, possessed, third-wheel/bodyguard. Any excitement about any of them is long gone, as Vaughn has clearly made the Kitty/Ben pairing permanent and unshakeable. There is also no personal investment in the story arc. Kitty is doing Anastasia a favor. Yeah, it has greater implications, but the entire mission feels removed from Kitty’s life. It’s not like Vaughn will kill off Kitty, Cormac or Ben … and if she would have killed off Anastastia, Henry, Grace or Sun, I can’t say I would have cared. So that leaves me… well… uninvested. It wasn’t a bad book. I liked it, but I didn’t love it. It just kind of felt like a bridge to intensify the conflict between Kitty and Roman. 3 1/2 stars. Has she toughened up as the series has progressed? Yes, she has. In fact, she has become the alpha of her own pack. Her character has grown alot over the course of the series. Blarg. I didn’t LOVE the last one as much as the previous ones and I am not enthused over this one either. Your review is telling me exactly what I’ve been concerned about. I’ll still read it of course! But yeah. I thought about you when I was reading this… since I know you were enjoying the earlier books. (**sigh**) I don’t want to give up on the series, but it needs to get an infusion of the spark it once had.